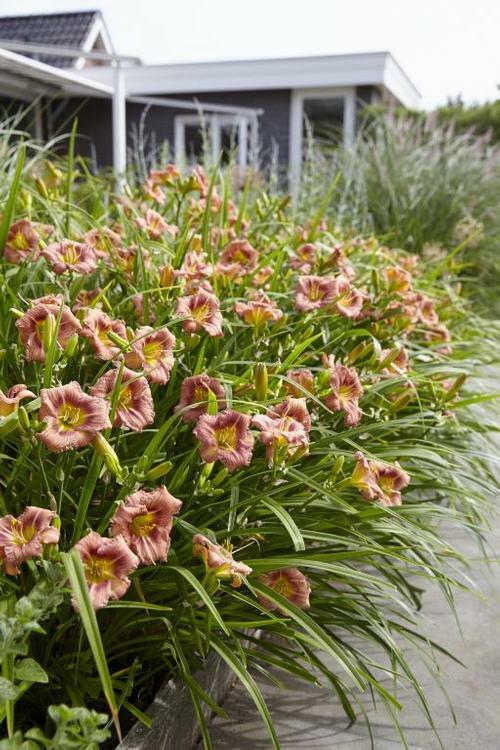 Early, a breakthrough series that can produce up to 400 blooms per season, two-toned rosy-pink flowers appear repeatedly all summer, the EveryDaylily® series are selections taken from the popular Stella d'Oro Daylily, dwarf habit and very hardy. Extremely popular perennial. Hemerocallis (Daylilies) are adaptable to a wide range of growing conditions and are very easy to grow. Once established, daylilies are very drought and heat tolerant, and are extremely long-lived. Extensive breeding efforts have produced plants of varying heights, flower color, bloom times, and rebloomers. Dormant: Plants are deciduous, completely loosing their foliage. Most dormant types are very hardy but may perform poorly in frost free areas. New growth originates from the formation of new eyes from the crown. Evergreen: Plants continue to grow in mild climates and foliage does not die back. Best types for extreme southern areas and less hardy in nothern areas. New growth originates from the center of the old foliage. Semi-Evergreen: Plants exhibiting characteristics of both dormant and evergreen types. Perform equally well in the North and South. Diploids: Daylilies with 2 sets of chromosomes. Usually faster growing, producing more "grassy" growth and ever-blooming types. Tetraploids: Daylilies with 4 sets of chromosomes. Usually produces wider and heavier foliage with thick sturdy stems. Flowers are larger with thicker petals, and colors are more intense. Extended Bloom: Flowers remain open for a minimum of 16 hours, good for evening viewing. Reblooms: Plants bloom heavily early summer and sporadically thereafter. Grow: Center and plant so crown is 1" below soil surface. Prune root tips for easier fit. Keep evenly moist and maintain pH 6.2 - 6.7. Grow in full sun at 55 - 60F. Fertilize moderately once growth appears. Most daylilies will flower 10 weeks after planting.